Join characters old and new as we celebrate Dylan and Lucas’s wedding. Feuding families, unearthed secrets, and a violent storm threatens the Cay. Will the idyllic island with her cast of characters make it through unscathed? It’s time for the circle to close on the story of Sapphire Cay, and on the men who have lived and found love on her beaches. 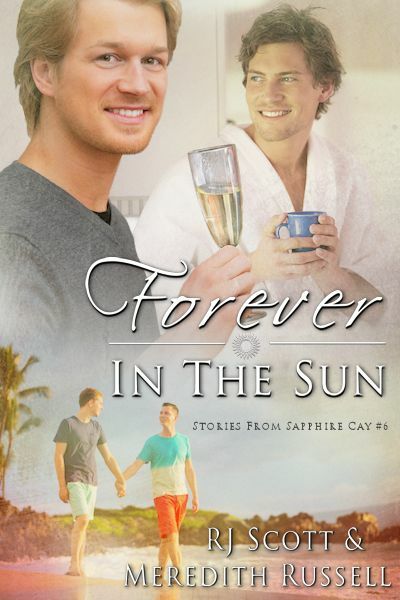 Join characters old and new as we celebrate Dylan and Lucas’s wedding and delve into the history of Sapphire Cay. Connor and Shaun are directly related to Peter and Alfie, a couple whose clandestine lover affair was overshadowed by old prejudices and a world war. Shaun Jamieson is a writer, a romantic and needs to pen the story of the affair’s final secrets; Connor French’s family wants to stop Shaun. When the two men step onto the sands of Sapphire Cay, they find more than just the secrets of an old love. They find hope and comfort in each other. But with the past hanging over them, can they ever have what Peter and Alfie could not? Or are they just as ill-fated as their ancestors?